Anole is a professional hot runner system maker in china. 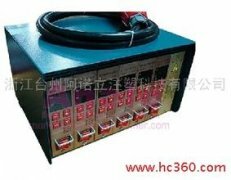 Temperature control box is an important part of hot runner system. here i want to show you the Misunderstanding of temperature control box to help you choice it. First, some people may think that the if the temperature control box do not move ,it indicate it is stable. This is totally wrong understand. Mold opening and closing cause air flow, and the temperature will change. And if the temperature control digital display does not change, it dees not means the temperature does not change, but the change of temperature is hidden, namely the termperature is showed are not real . The stability of temperatiure control means in the practical work, the system into temperature fluctuation is smaller, the better the stability. The second point is that Many people think the temperature soon will be able to rise to the set value, the thermostat is better. In fact this is a very serious misunderstanding. Heating to meet the heat conduction and heat distribution which should have good temperature curve. Not the sooner the better, excessive heat can not only increase the production efficiency, but also will cause the damage of hot runner and related components. Here are the two main misunderstanding of temperature control box.